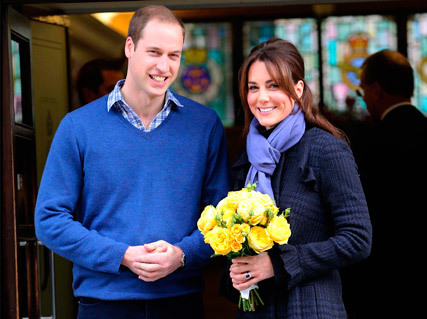 Kate Middleton was said to have been ‘delighted’ with a special set of pregnancy lingerie, sent to her as a get well gift as she recovered from a bout of morning sickness in hospital. After a spell in the King Edward VII last year, the Duchess of Cambridge was sent the token by nursing lingerie specialist Lorna Drew, and was said to be ‘delighted with the thoughtful gift’. The company sent lucky Kate an ivory satin Alexa bra and brief, and a rose printed Amy bra and brief from the collection, designed specially for nursing mothers and mothers-to-be. Lorna Drew, MD of Lorna Drew Nursing Lingerie told Marieclaire.co.uk: ‘I know Kate would be feeling pretty dreadful and thought that she could do with special gift, as nothing makes you feel great like beautiful lingerie, so we sent her some! Earlier this week it was revealed Kate Middleton has been hard at work getting not one, but to nurseries ready for the royal baby’s arrival in July. It’s thought the Duchess is preparing rooms in homes at Kensington Palace and Anmer Hall, and was eve spotted browsing antiques for her little one in the market town of Holt, during a girlie weekend in Norfolk with friends.